Shopping for dad can be hard and with Father’s Day just around the corner, it’s probably safe to say many of you still haven’t settled on the perfect gift. Luckily, we have some fun and functional ideas that dad is sure to love! Just because it’s Father’s Day doesn’t mean you can’t give dad a gift the whole family will love. Not only will he be excited to display his sleek, new Weber or Charbroil grill on the deck, but it will also guarantee you some delicious summer meals! Have you been meaning to tell your husband that the hedges are looking a little haphazard? Giving him a Craftsman 22” Hedge Trimmer for Father’s Day will subtly send the message and give him the perfect tool to handle the job. Plus, no man will ever complain about adding another high-quality gadget to the garage. The yard work is often dad’s domain and an Electric Grass Trimmer is a tool shed must-have. However, if you’re looking to really spoil the father in your life, upgrade to a Craftsman Trimmer & Blower Combo Kit. It will give him everything he needs to put the finishing touches on his latest landscaping project. After dad has spent hours on end doing yard work, he should have a place to sit back and enjoy his masterpiece. Let him relax in a new Zero Gravity Chair. This outdoor reclining chair is weather-resistant, durable and most importantly, comfortable. 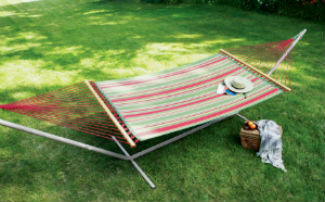 Or, if you want to take relaxation to a whole new level, give dad a folding hammock (no trees necessary!). Its lightweight design and portability makes it easy to seek out sun or shade on a beautiful summer day. But, don’t be surprised if you frequently catch dad snoozing in the backyard. A toolkit isn’t complete without a power drill and driver. The Craftsman 19.2V is perfect for small fixes at home or more serious projects. But, be prepared to see dad’s pearly white because he’ll be smiling for quite a while if this is what he opens on Father’s Day. Dad may have all the tools he needs, but does he have a place to put them? After all, those valuable gadgets deserve a good home. A Craftsman Tool Center will not only help dad stay organized, but it will also keep the garage clean. Looking for something a little simpler? You can’t go wrong with a portable canopy tent. Its compact design makes it perfect for camping, tailgate parties, picnics and BBQ’s. Still stumped? 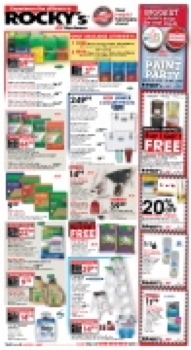 Relieve the shopping pressure and give dad a gift card to a store they really enjoy… Rocky’s Ace Hardware! You choose the amount and they can choose a gift they really want. Finding the perfect Father’s Day present doesn’t have to be stressful. Here at Rocky’s Ace hardware store, we can help you find a gift that will leave any dad happy.